I realized it was almost October and I’d still only done one Pair-a-Thon Pin-Up prize. Oops. 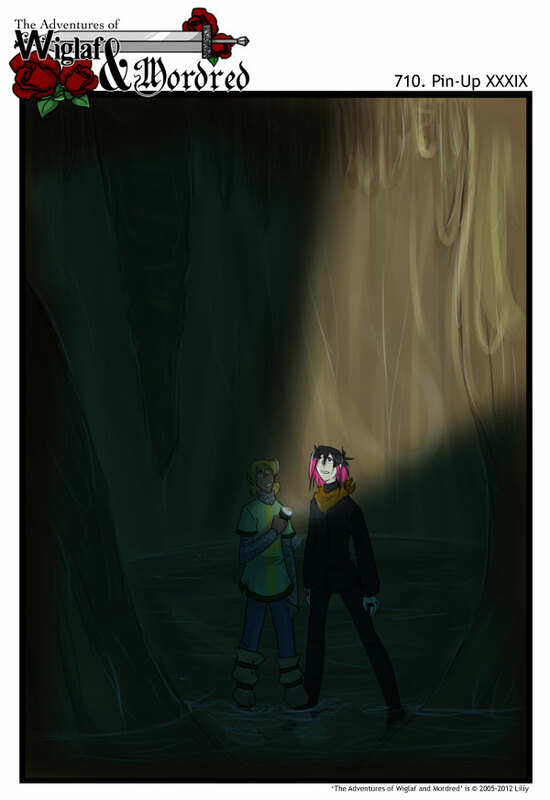 This one is for Madeline, who requested Wiglaf and Mordred exploring a cave. I may really like caves and may have spent more time on this Pin-Up than normal. *cough* I try not to play favorites, but I really do love caverns, and underground lakes, and I remember the feeling of total pitch black darkness when in a cave. I really. Really. Love this song. Wow, Mordred looks tall in this. Nice cave. Lovely. I like the soft treatment you’ve given the hard rocks. And it’s nice to see full-body characters, too, especially with the quick-fade to darkness. I can see you put a lot of time into this; the detail below their knees and into the water is fanatstic. Great scene. The scale of the cave’s walls serves to show what a big place the two of them are in. The lighting from the flashlight also looks quite appealing.